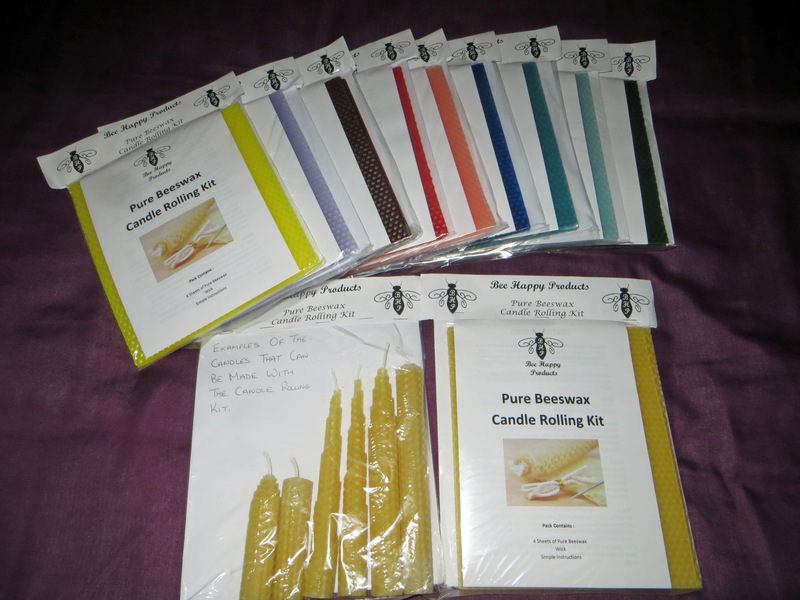 New to our website this week are candle rolling kits. Fun for the kids as well as adults as there is no hot wax to worry about. As you can see from the picture, there is a variety of candles that can be produced. These are sold for £6 each or two for £10 plus p&p in a variety of colours. Available in natural, ivory, yellow, blue, red, green, purple, lilac, pink, light aqua, dark aqua, and burgundy. Details are on our website from the link on the top menu. Had quite a few boxes of cut comb frames to re-wax ready to go back on in a few days time. 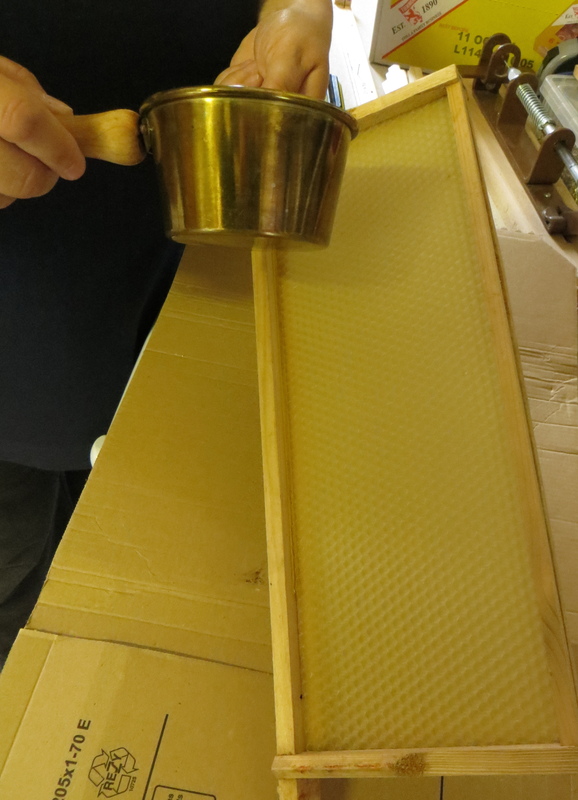 The cuts of comb from these boxes have already been sold and is becoming a very popular way that some customers are buying our honey. As you can see the empty frame below has been cleaned in the boiler ready to take another sheet of foundation. The foundation is very thin and unwired, just what you need for cut comb. The picture below shows the foundation placed into the frame ready for Sally to pour hot wax to hold it to the frame. Here is Sally dribbling the hot wax to hold the foundation securely until the bees have started to draw the foundation and secure it to the frame. We don’t use the wedge for these frames as they are not necessary and it makes re-waxing a simple job. Quite a few boxes done for today and we will probably need to do some more in a few days time when the other boxes are taken off, cut and cleaned up. Loaded up this morning with twenty supers expecting to only use a few but took them just incase. First apiary is where we have our mating apiary, so it was a quick look at some of the nucs that are destined for the heather in July. These were made up with our early mated queens and after looking at them, it was decided to transfer them to deep national boxes. Later this month, the frames of brood will be rearranged for the heather but i will take some pictures and give an explanation nearer the time. I placed supers on a couple of hives as they were obviously in need of the storage space. Next apiary has only six colonies, which is a shame as they always do well here but there is just not the space for anymore. After inspecting the stocks and placing supers on those that needed them, i stood back and counted two colonies with four supers two with three and two with two supers. If the lime keeps going i can see me putting supers on again next week. The next apiaries all required supers and i returned back to the bee unit with just one. It was getting to close on 6 o’clock and we still had comb to cut and honey to bottle. Sally called in on her way home from work and gave me a hand which was great as i could see myself at the bee unit until late into the evening. The England game was on and i wanted to see it. Update: Oh well there is always the euro championship. Today I headed to the meadow apiary where after giving all the colonies supers, I realised that next week I may have to extract some, as they are now at head height and I will have trouble getting more on later. Called on Lorraine to help with her hives today and after a cup of welcoming tea, came away with bacon and eggs from the Ugly Pig Farm Foods. Thats breakfast sorted for the morning. Her hives are doing well and after placing a super on one, it was decided that next week I would extract a couple of supers. Inspections of all the colonies and apiaries this week has been hard work. Not the fact of the inspections, just that the warm weather and a bee suit do not work well together. This entry was posted in Beekeeping and tagged bee farmers, Beekeeping, Bees, Frames. Bookmark the permalink.